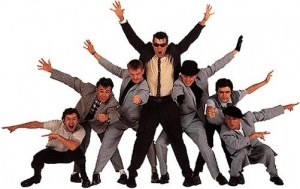 Madness are a highly regarded UK Ska / pop band, evolved from the London-based Invaders in the summer of 1979. Their line-up comprises Suggs (vocals), Mark Bedford (bass), Mike Barson (keyboards), Chris Foreman (guitar), Lee Thompson (saxophone), Chas Smash (vocals, trumpet), and Dan Woodgate (drums). Madness is one of the most successful singles bands in the history of the British charts. They were the biggest selling singles act of the 80’s. Selling millions of records worldwide, Madness have become one of the best loved British bands of all time in the process. Formed in North London, Madness chose their name in honour of an old Prince Buster ska song and launched themselves on the wave of Ska and 2 Tone then sweeping the country. Madness quickly established their own musical style, dubbed the nutty sound, with the release of their first single, ‘The Prince’. Between 1979 and 1986 the band notched up an astonishing 21 Top 20 hit singles, including ‘It Must Be Love’, ‘Baggy Trousers’, ‘My Girl’ and ‘Our House’. The remainder of the 90’s saw more sell out arena tours and Top 10 hits for Madness with singles including ‘Lovestruck’ and their seventh studio album, ‘Wonderful’. In 2002, the acclaimed musical ‘Our House’ (featuring songs of Madness) won an Olivier Award for Best New Musical. 2005 saw Madness release a new album ‘The Dangermen Sessions Vol 1' through V2 Records, entering the charts at no. 11 on its release. 2009 saw the release of 'The Liberty Of Norton Folgate' for Madness, the bands first original album since Wonderful in 99. The Liberty Of Norton Folgate entered the UK album chart at number 5 and remained in the charts for in excess of 10 weeks. 2011 saw Madness headlining Glastonbury and Madstock and many other European festivals. They released studio album Oui Oui Si Si Ja Ja Da Da in October 2012 and continue enthralling their audiences playing for The Queen and the UK Olympics in 2013. 2016 sees the release of the new album 'Cant Touch Us Now'.